how about an ingredient list????? Or am I just missing it????? I'm going to try this for dinner tomorrow! I think the ingredients are just ground meat, taco sauce, cheese, & noodles. Brown the meat & add taco seasoning like you would if you were making tacos. cook the noodles. 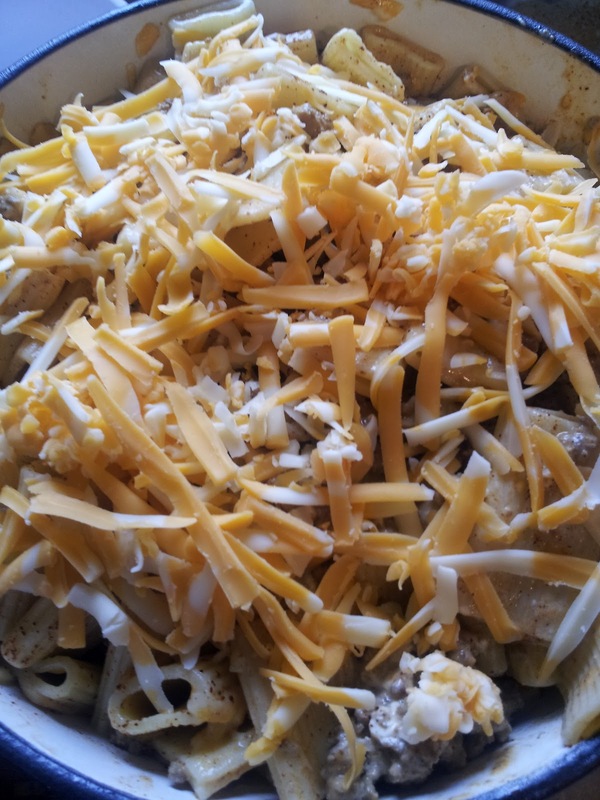 mix it all together, toss on some cheese & bake it! That's how I took it anyway & that's what I'm going to try tomorrow. Hi all, the post is now updated with a more straight forward ingredient list and directions, let me know if you have any questions. Can you freeze before baking?? Yes you can freeze, but when freezing any pasta it's usually a good idea to add a bit of extra sauce so it doesn't get dry when heating. Should this be covered or uncovered? Thank you! Under the picture it says covered so I wasn't sure. Thanks! I fixed it, if you cover it you might lose half your cheese on top. Since it's only at 350 degrees I have never had a problem with the top drying out. In the oven now. Will let you know how it turns out. Thanks for a super easy and super cheap recipe! Perfect, it's so yummy :) We just had it again last night. It really depends on how many noodles you use, just use whatever pan fits all the noodles. I've used a 9x13, a tin foil lasagna pan, in the picture I'm using a cast iron pot. Do you have to coat the baking dish with grease before putting into over? In case of it sticking or something? I do not coat the baking dish, I've never had the noodles stick. The taco sauce it quite liquid-y and we have it at a fairly low temp, so it's never been a problem for me. I've got this in the oven now, and it looks so good! Is half a package of cream cheese 4 oz or 8 oz? This looks DELICIOUS. I will be making it very soon! This was really easy, really good, and best of all, I had all of the ingredients on hand! I used the Rachael Ray make your own taco seasoning. Thanks for a great weekday meal! Did you fix a side item or eat just this dish? Why do you rinse pasta with cold water? I was always told not to rinse pasta after you cook it. Its to shock the pasta into not cooking while it sits. So it doesn't stick and doesn't melt the cheese into a gloppy mess. I just made it tonight for supper!! It was so good. I will be making it again!! Cannot wait to make this! I may add some green onions and top off with diced tomatoes when it comes out of oven. Gonna make corn bread too!!!! I just made this for dinner I was so excited to try it! Well I have no clue what I did wrong! Mine was dry and not looking as creamy as the picture. My family said they liked it but needs more sauce. I will try again in a few weeks! Hi Molly, try some extra cheese maybe? 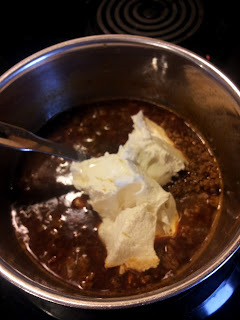 You could double up the sauce as well, or if you just want it creamier try using more cream cheese. Let me know how it works out and so sorry your first attempt was not what you were expecting. Made this for dinner, followed the exact recipe ... it was delicious! The kids loved it too.... yummy! Hi Glendalgo, in Canada a brick of cream cheese comes in 250g which is 8.8 ounces. And I would not say my sauce is a real creamy texture, but I do find the cream cheese helps the sauce stick to the noodles instead of just running to the bottom. I just put it in the oven. It was super easy and I hope it turns out good! Thank you for this recipe. Fabulous!! Hope everyone enjoyed it JulieAnn! Looks delicious! I'm making this tonight, Hamburger Helper is my favorite, but I am staying away from processed foods when possible, thanks for the great 'substitution' recipe! Just made this - and yum! I think in the future I will either increase the amount of sauce or cook it covered. I also think that it would be yummy without baking it. Making this tonight with shredded chicken, peppers, onions, and tomatoes. Can't wait to try it! Have you tried this with chicken?? I'm going to try this tomorrow for dinner but with chicken!! Loved it! Delicious!!! But next time I wont let my pasta sit while waiting for ground beef to finish. It seemed kind of hard after baking. Just put it in the oven!! can't wait to taste!! Big hit in this house!! Definitely goes on the "make again" list! This was really good!! My boyfriend and I love tacos - we could literally eat them for every meal. By making this, we still got our "taco" but it was nice to give it a little twist! And the recipe is so easy!! Love that everyone is enjoying the recipe, and adding chicken sounds great!!! We loved it! I bet it would be good with corn too. Do you HAVE to use cream cheese? Could mile be a substitute? I used Velveeta instead of cream cheese and it turned out amazing! I would not use milk, I think it would be too liquid-y, you could for sure use sour cream in place of the cream cheese though! Making this now! Hope it turns out as yummy as yours did! I added crush taco shells on top! Excellent! If I substitute sour cream for the cream cheese how much sour cream should I add???? i forgot my ingredient list when i went to the store, i got sour cream instead of cream cheese... hope it still turns out!! Just put this in the oven. Can't wait to taste it, smells devine. I'd start with half a cup of sour cream and go from there. And so happy it's been working out for everyone!!! has anyone prepared the hamb and noodles ahead of time and placed in crockpot in the am before work for supper in the pm? Making this tonight.....very excited to make it! I'm using med shell pasta. How much cream cheese are ppl using?? And we leave some water left after cooking the meat, correct? This was fab! I substituted with ground turkey and hot taco seasoning, as my husband and I love spicy food. I also only added a 1/2 cup of pasta water because I think a cup would have made it a little bland. Yum! sounds very quick and simple.. Gonna try it tonight!!! When you say 1/2 to 3/4 of a bag of pasta, our pasta is usually in a one-pound box. How big of a "bag" do you have? Just wanting some idea of how much pasta. Thanks! Do u drain the grease off of the ground beef? Could this be put together, then frozen to be cooked at a later date? I'm looking for simple freezer meals and we LOVE tacos around here! I added a can of rotel to the meat also and it was super delicious! Some for my family and some for my sister who just had a baby - this will freeze beautifully, I have no doubt! That 1 cup of water I believe is crucial as it helps to make the "sauce" once the cream cheese is added and it will prevent the pasta from drying out! Yum! Thanks so much for sharing this with us, Stacey! Awesome, so glad it worked well for you Amanda!!! lindsay - I don't see your comment here anymore, but you can use sour cream in place of the cream cheese or skip it altogether. It will still be good, you just won't have a creamier sauce, mix well so you coat the noodles. I am cooking this today!! I made this recipe with 1C chopped onion before adding ground turkey (our ground meat preference) & used extra taco seasoning as I buy it in bulk & like a strong taco flavor. 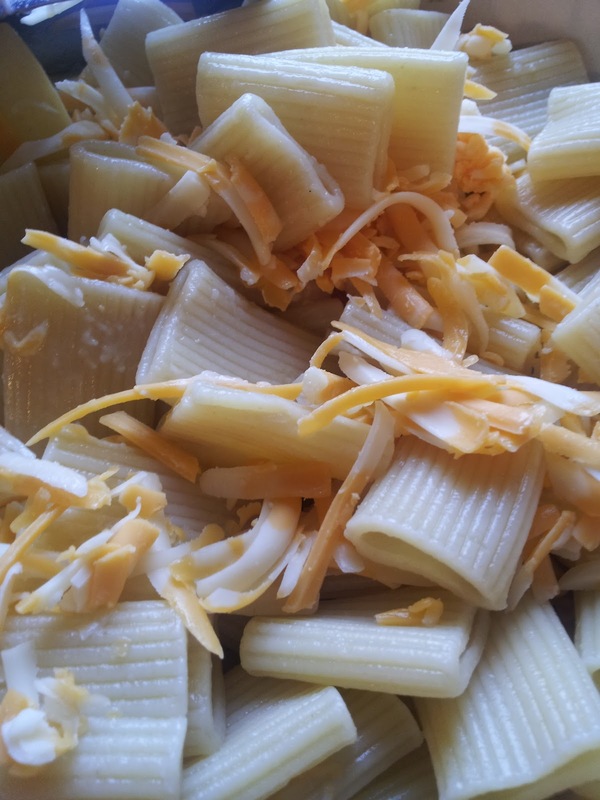 I also used 1/2 fat cream cheese, large shell noodles & baked in a 9x13 pan. It was delicious & super easy! I usually don't make comment on things but this time I feel I need to. Ingredient wise this is an awesome dish. However the directions are a set up for failure. Pasta in a recipe like this should never ever be rinsed! It needs the starch from the cooking on it in order for the sauce to actually stick to the pasta. Same goes with making spaghetti and having the red sauce coat the pasta and not just sit on the bottom of the dish. Secondly I recommend making the sauce before the pasta is finished. That way the pasta is still hot and will soak up the sauce better and require less bake time as all ingredients are hot and just need baking to melt the cheese on top and allow a bit of time for the flavors to combine. I was able to shave about 10 mins off the bake time. Hi Janelle, thanks for your comment and whatever works for you is great! I agree pasta should usually not be rinsed, but I personally wanted this recipe very cheesy and I add cheese to the pasta before covering with sauce. If I mix hot pasta with cheese all I get is a melty, mucky mess, so this works best for me. This was so so so good. I followed the directions you gave and it could not have turned out any better. The only thing for me was that I felt it needed a wee bit of salt--but that's just personal preference. I will definitely be making this again, and soooo glad I have enough for lunch tomorrow! Mine turned out a little dry, any suggestions? I used left over taco meat and cooked the ziti and then mixed it up and added salsa and then baked it for 20 min in the oven. Didnt add cream cheese and it was very good!!! I have made this the last three weeks - it is great to freeze and heat later on. Absolutely LOVE this dish - super easy and reheats perfectly. We loked it also. I made my own taco sauce and I think that makes it even better. Hi April - I have never made pasta in the crockpot, so I simply don't know, especially how much liquid you would need - sorry I can't be of more help! For servings it really depends on how many noodles you use, but approx 4-6. Made this for dinner the other day and it was all gone by lunch the next day!! I substituted in ground turkey and cheesy taco seasoning and this meal was still super yummy!! Thanks for sharing! Made this for dinner today. I added a cup of salsa to the meat mixture. Husband loved it. I made this for dinner tonight. It was very good, mine could have used more sauce or covered as some of the top noodles got a little dry. I then read all the comments and I like the idea of adding salsa or Rotel anything to add a little more sauce. Looking at the picture your sauce looked much more saucy, maybe I used too much meat? Another comment was to use more taco seasoning, if I had bulk seasoning I think I would add a little more and maybe another 1/2 cup of water. I also like the idea of adding corn. I know I will make this again. Thanks for the great, easy recipe! This was good...however I added a cup of salsa to it because i did not want it to dry out..Also..cooked for 15 minutes in the microwave instead of the oven...It overall was very good!! Got 4 thumbs up from 4 boys!! I made this last night for dinner. It was really good, but it tasted like it needed a little something else any suggestions for next time. I put everything in it that the recipe called for. Anon - we enjoy it best this way, but if you read through the comments others have added salsa, corn, rotel and/or chopped onion. in the oven right now! :D i sampled it before i put it in and OH MY GOD! 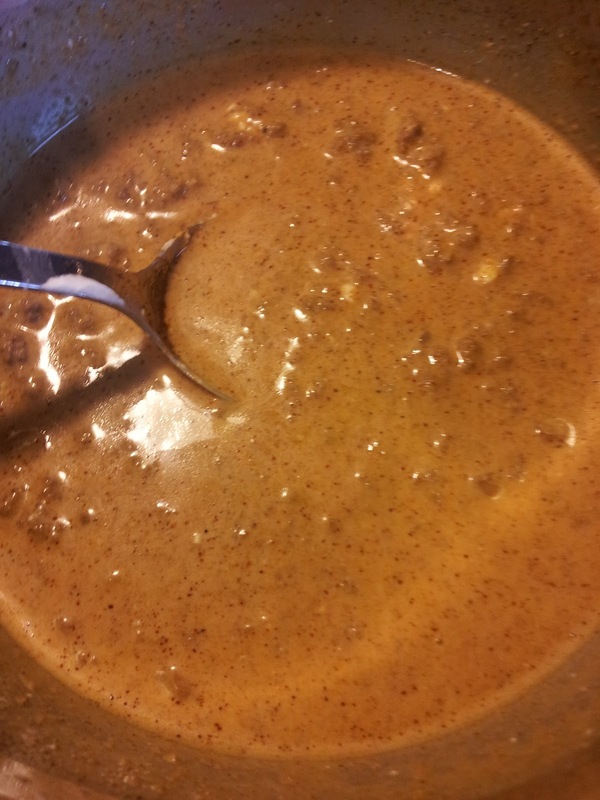 i added onion soup mix and some three cheese spaghetti sauce to my ground beef ! it already tastes delicious and it's not even 100% cooked yet! great recipe! This was delicious!! Made it for my boyfriend tonight and he said it is a keeper. I added some diced onion, hot rotel tomatoes, a little garlic, and cumin. We also crushed some tortilla chips on top for some crunch but it really did not need it. Thanks for sharing!!! I made this for dinner tonight. Yumm! I didn't put it in the oven tho. I just browned the burger and added in the water, taco seasoning and cream cheese. 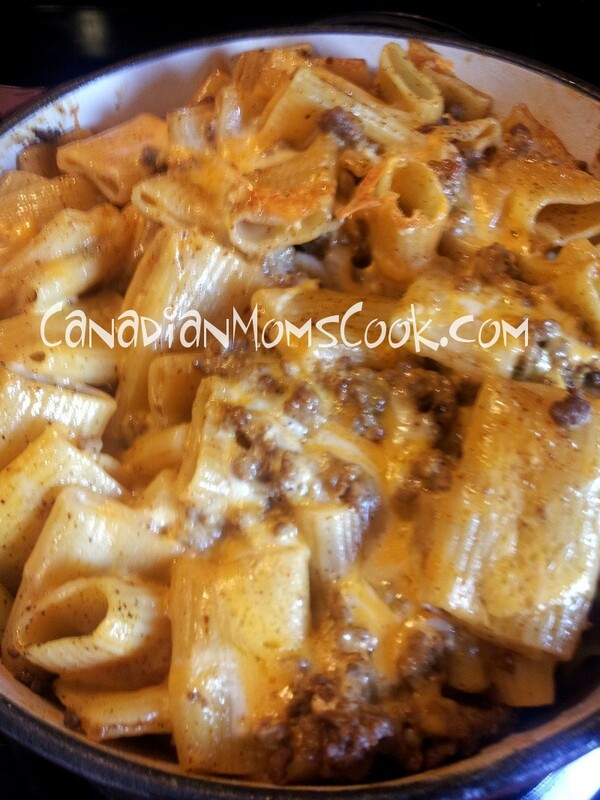 I boiled the pasta and then just added it to the skillet and then topped with cheese! Mixed it all together and topped with more cheese!!! A keeper!!!!! I made this tonight with the addition of ro-tel tomatoes with diced green chili's and added a can of drained/rinsed black beans. My family loved it, including my 2.5 yr old! I should also mention that we are gluten free so I used quinoa pasta. It worked really well cooking to al dente. made it today :) added some corn into it - so so good ! Can u sub the cream cheese? Very good! Winner with my family! Could be good cold as a salad with some jalapeños, green onions, cherry tomatoes, shredded lettuce and maybe sub half the cream cheese with fat-free plain yogurt! My family loved it! We are making it again! I've made it a few times! Featured it on my blog........and linked you! 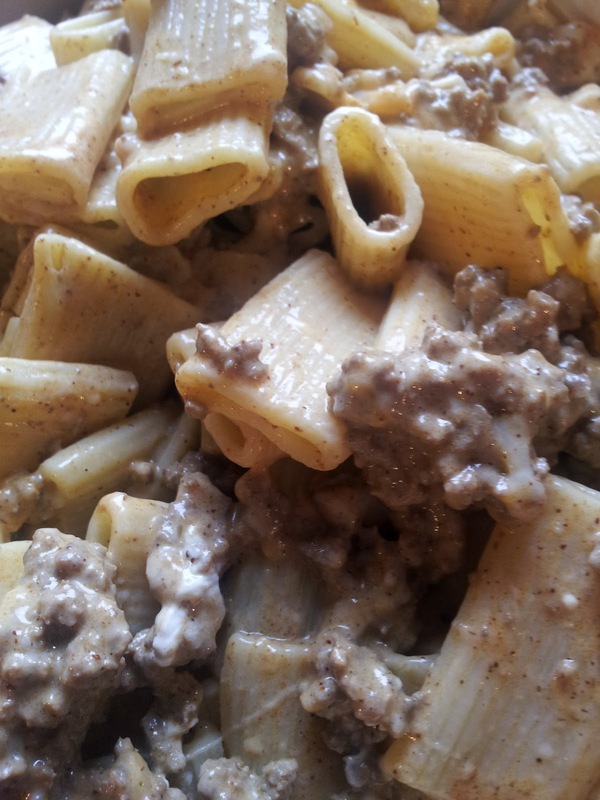 This is like a more awesome, homemade version of one of those hamburger helper dishes. Suuuper easy too, though I didn't have any rigatoni so I used shells, used the low-fat cream cheese (still tastes pretty awesome) and lack casserole pans so I just did everything in a skillet (hooray less dishes!) and chucked it in the oven. I also felt super guilty about it having no veggies, so I tossed in some onions and red bell peppers. Yuuuuuuum. In the future, since I love garlic, I might add a little bit of that, and maybe some corn or something. Black beans might be nice too, or pepperjack cheese! Mmm. I didn't read the comments until after I cooked it lol, but I actually didn't reduce the taco sauce down all the way - I left a little bit, like enough to cover the bottom of the skillet so I still had enough sauce to cover everything, otherwise that might have been a problem. Definitely doing this again. Going to try really hard to leave lots of leftovers but yeah, that might not happen. Yum! this sounds so yummy and so easy! :) Pinning! Do you need to drain the beef of its grease before adding stuff to it? Can't wait to try this! Looks so yummy! My Hubby just put this in the oven and MAN does it smell AWESOME!!! He's the cook in the family and had this whipped up in no time. I'm sure it will taste as good as it smells. Thanks for the recipe!! Greetings from Texas... my kids love this have asked me for it about 12times in less than 2weeks.... thanks for sharing this delicious meal!!!! Hi from North Carolina. Found this on Pinterest and made it tonight. It is AWESOME. Made it with ground chicken, light cream cheese and fat-free cheddar. We will have this again. Hi, I love this recipe and tried it the other day. However, I drained the ground beef before adding the water mixture and it ended up turning out with a few dry noodles on top...Should I have not drained the ground beef??? I made this tonight for dinner, using sundried tomato & basil cream cheese. So good! 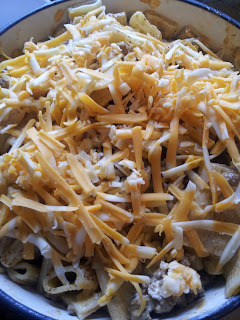 I am going to make this tonight but use philly nuefchatel cheese to reduce fat. and I am going to reduce sodium taco seasoning. i think this might be a slightly healthier alternative. I will let you know how it works. I love this recipie! I was in a pinch so I made it without baking it and it was delish. Kind of like a hamburger helper but much better. Then I put the leftovers in a 8x8 pan to freeze for later. Thanks for an awesome go to recipie! Yum! This was so tasty! I made this recently but made a few changes... I used ground turkey and whole wheat pasta instead. I also added stock instead of water for extra flavor and 8 oz of salsa. Thanks for such a great idea! I substituted a cup of greek yogurt for the cream cheese. Tasted great! Do you serve it with anything or just by itself. We have had it on its own or with a salad. Planning on making this sometime this week! Should I drain the fat off the ground beef before I add the water? Yes, drain the beef. I cook with extra lean and usually brown big batches of ground beef and store them meal size separately in the freezer then just pull out as needed. What a super easy meal! I made a few additions - I added two frozen spinach bundles and grated parmesan cheese to the top. I wanted mine a bit more saucy so just added a bit more water. We're trying this tonight! Can't wait!! Made this for dinner tonight! Was so tasty! We ate with salad and rolls. I added diced tomatoes to the mix for a bit more substance to it! My picky 4year old loved it. Thanks! Def going to make it again. This looks delicious definitely would be a hit in our house. Trying your recipe now, with whole wheat pasta. Smelling great from the oven. Such an easy recipe, I was so looking forward to loving it, but I didn't :( The sauce tasted like a watered down taco mixture. Unfortunately, my husband is very fussy, so I can't flavor it up with anything like corn, tomatoes or salsa. I was hoping the simple ingredient list would work for us, bummed it didn't. Thanks for sharing, I look forward to making other things soon! I'm sorry that you didn't enjoy it. Not every recipe is for everyone. We wish you luck in finding recipes that work for you and your husband! i made it tonight for dinner, i thought it looked really simple and quick which it was but it was so dry when it came out of oven. i got a plate took 2 bites and tossed the rest, my husband did the same. the beef mixture was good and I think it would have been fine but with baking it was really dry. Mine was also dry. I think if I were to make it again, I would cover it with foil when it went into the oven and then when it was ready to come out, I would sprinkle more cheese and then leave it in for one more minute before taking it out. This is what we are having for dinner tonight...Will let you know how we like it. I made this last week. It was really, really good. My kids loved it. I did not put mine in the oven, however. I cooked everything and then just added the pasta to the meat mixture in the skillet and let it simmer for a few minutes. It was not dry at all. I'm not sure its necessary to put it in the oven. So good! Absolutely delicious, thanks for sharing. Love this! Mine dried out a bit first time I made it too...so I think I'm going to just use a smaller pan this time (I used medium shells, 3/4 box in a 9x13 pan). I think that will do the trick. I use ground bison instead of beef. I bet my son would LOVE this! I'm really enjoying the theme/design of your site. Do you ever run into any internet browser compatibility problems? A number of my blog audience have complained about my site not working correctly in Explorer but looks great in Opera. Do you have any ideas to help fix this issue? Mmm I love anything taco inspired! Looks tasty! Thanks this looks yummy, will be trying it out soon! This Taco recipe looks and sounds really good. Gonna have to try this one, looks so yummy! I can see why this would be popular...looks delicious! My mouth just filled with saliva. This looks utterly delicous! Can't wait to try this, my kids love anything with pasta and I love that with the taco flavor easy to dress it up with some added veggies! Can you make this ahead of time and put it in the fridge for a couple of hours? any difference in the baking times, etc? You absolutely could do that. I would suggest adding approximately 20 minutes to your cooking time and remember to put the casserole in a cold oven to start! I see why this recipe is so popular! It's so easy and sounds delicious! Could you tell me how many ounces of pasta you used? It comes in a box here, so I don't know how to compare what to use. I have made this many times and still get asked for it once a week. Thanks so much for the great recipe! This looks delicious, it's in the oven now!! (: So excited to eat it!! Thanks!! After reading all of the comments and after seeing what the sauce to pasta ratio was upon mixing the two, I made another recipe of sauce (one packet low sodium taco flavoring, 4 oz. cream cheese and 2/3 cup water as per package instructions. I poured this second sauce over and mixed it in. Wow, I'm glad I did. It would have definitely been too dry. This was delicious! I appreciated everyone's suggestions and made my own variation! I would never have thought of adding cream cheese to this. Looks interesting. Made thus tonight but no one in my family (except me) likes cream cheese so I used Velveeta instead and it turned out awesome! I have made this several times (sometimes using ground chicken or turkey) and my family loves it! It is quick and easy and make with ingredients I usually have on hand.